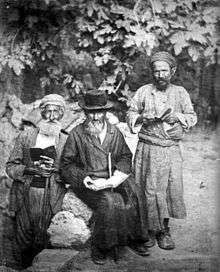 From the start of political Zionism in the 1890s, Haredi leaders voiced objection to its secular orientation, and before the establishment of the State of Israel, the vast majority of Haredi Jews were opposed to Zionism. This was chiefly due to the concern that secular nationalism would replace the Jewish faith and the observance of religion, and the view that it was forbidden for the Jews to re-constitute Jewish rule in the Land of Israel before the arrival of the Messiah. Those rabbis who did support Jewish settlement in Palestine in the late 19th century had no intention of conquering Palestine from the Ottoman Turks, and some preferred that only observant Jews be allowed to settle there. During the 1930s, some European Haredi leaders encouraged their followers not to leave for Palestine where the Zionists were gaining influence. When the dangers facing European Jewry became clear, the Orthodox Agudath Israel organisation decided to cooperate to an extent with Zionist leaders in order to allow religious Jews the possibility of seeking refuge in Palestine. Some Agudah members in Palestine preferred to form an alliance with Arab nationalists against the Zionist movement, but this never occurred. Around 80% of European Haredim perished in the Holocaust. Israel today functions mostly as a secular state and has many laws which conflict with Halacha. Around 80% of Israeli Jews identify as "non-religious" or "traditional." Roughly 10% identify as "religious" and about 7% identify as "Ultra-Orthodox." A study in late 2006 claimed that just over a third of Israelis considered Haredim the most hated group in Israel. After the creation of the state, each individual movement within Orthodox Judaism charted its own path in their approach to the State of Israel. In the hope of winning over the Hasidic masses to the Zionist Organization, Theodor Herzl endeavoured to garner support from one of the most prominent rabbis in the Austro-Hungarian empire, David Moshe Friedman (d. 1903), the Rebbe of Chortkov. He maintained contact with him for over three years, during which time he tried to convene a conference of rabbis to promote Zionism; however, nothing ever materialized. Friedman had been a long-time supporter of efforts to settle Jews in Palestine on strict conditions that they adhered to Jewish law. He had in fact been an early member of Ahavath Zion, a Zionist organization specifically established in 1897 to inform religious Galician Jews about the plan for a Jewish national home. Although Ahavath Zion was successful in attracting thousands of members and numerous rabbis from smaller communities, it could not stem the rising anti-Zionist sentiment among the majority of Orthodox leaders. Besides for Friedman, they simply could not persuade any of the other great Hasidic leaders to support the Zionist project. The Hasidim in particular were vociferous in their opposition and often protested against the Zionists. They even went as far as banning the Star of David, originally a religious symbol appearing only in the synagogue, which had now become "defiled" by the Zionists. 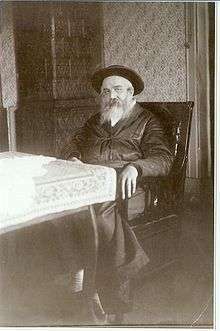 In 1889, Rabbi Joseph Dov Soloveichik had proclaimed early Zionist initiatives as resembling the 17th-century false messianic sect headed by Sabbatai Zevi. His son Rabbi Hayyim Soloveichik further warned: "The people of Israel should take care not to join a venture that threatens their souls, to destroy religion, and is a stumbling block to the House of Israel." When the Zionists in Brisk claimed that Zionism would stem the tide of Jewish assimilation, Soloveichik felt that what mattered most for Judaism was the quality, not the quantity. Powerful condemnations of political Zionism continued into the twentieth century. In 1903, Rabbi Sholom Dovber Schneersohn of Lubavitch published Kuntres Uma'ayan, which contained a strong polemic against Zionism. He opposed the Religious Zionist movement and was deeply concerned that secular nationalism would replace Judaism as the foundation of Jewish identity. Rabbi Baruch Halberstam (d. 1906) took a leading role in opposing Zionism, in line with the position held by his father, Hayyim Halberstam of Sanz. In 1912, Orthodox leaders in Europe founded the Agudath Israel organisation which hoped to find a "solution to all the problems facing the Jewish people in the Spirit of the Torah." From the outset, the Agudah vehemently opposed the Zionist movement for replacing the historic religious bond to the land of Israel with secular nationalism. Israel Meir Kagan stated that the fate of the Jewish nation was to remain in exile until the arrival of the Messiah. But with the spread of anti-Semitism in Europe, some Orthodox leaders became more favourable towards the aims of Zionism. Rabbi Isaac Breuer implored Agudah members in 1934 "not to leave Jewish history to the Zionists," hoping that religious Jews would assist in establishing a Jewish homeland. Others remained staunchly opposed, chief among them the rabbi of Munkács, Chaim Elazar Spira (d. 1937) who was the fiercest opponent of Zionism among Hasidic rabbis. Spira saw Zionism as a denial of the Divine Redemption and faith in the Messiah. He even objected to Agudath Israel because of its support for immigration to Palestine. In 1936, he initiated a publication against the Zionist enterprise which was endorsed by 150 rabbis. During the wartime period, Rabbi Elchonon Wasserman (1875-1941) of Baranowicze wrote a pamphlet in which he blamed the Zionists for the persecution of Jews in Europe. He rejected the notion that a secular Jewish state could be considered the "advent of Redemption." The goal of Zionism was to uproot religion and Jewish tradition. At the 1937 Agudath Israel Great Assembly in Marienbad, most discussions were devoted to the question of the Jewish State and the Nazi rise to power in Germany and increasing Anti-Semitism in Poland and Lithuania. Palestine beaconed as a refuge for the religious European masses whose situation was gradually worsening. While the majority of attendees rejected on principle and practical grounds the establishment of a secular Jewish State, a minority influenced by the dire situation were in favour. Within Palestine itself, the Old Yishuv was alarmed by the influx of non-religious Jews who wished to establish a secular state in the Holy Land. The chief rabbi of the Ashkenazi community in Jerusalem, Rabbi Joseph Hayyim Sonnenfeld, often referred to the Zionists as "evil men and ruffians" and claimed that "Hell had entered the Land of Israel with Herzl." Sonnenfeld did not want the Orthodox Jewish community to become subject to secular Zionist authority. The spokesman for the anti-Zionist Ashkenazi community in Jerusalem, Dr Jacob Israël de Haan, endeavoured to form an alliance with the Arab nationalist leadership and hoped to reach an agreement that would allow unrestricted Jewish settlement in Arab lands in return for the relinquishment of Jewish political aspirations. In June 1924, de Haan was assassinated by the Haganah after having conveyed his proposals to King Hussein and his sons, Faisal and Abdullah. Agudath Israel in the Land of Israel rejects outright any attempt at despoiling the Land of Israel of its sanctity and considers the proposal to establish a secular Jewish state in Palestine as a hazard to the lofty role of the Jewish People as a holy nation. Agudath Israel in the Land of Israel declares that Orthodox Jewry could only agree to a Jewish state in all the Land of Israel if it were possible for the basic constitution of this state to guarantee Torah rule in the overall public and national life. The Agudah in Europe grudgingly began to cooperate with the Jewish Agency and other Zionist bodies in an effort to alleviate the situation facing European Jews. In response to this, Amram Blau and Aharon Katzenellenbogen of Jerusalem broke away from Agudah in 1938 to form Neturei Karta who refused to have any dealing with the Zionists. During the 1940s the Neturei Karta became increasingly critical of the Agudah's position and in 1945 they succeeded in expelling Agudah members from the Edah HaChareidis. In 1947, Chief Rabbi of Jerusalem Yosef Tzvi Dushinsky petitioned the UN on behalf of his 60,000 strong community that Jerusalem not be included in the Jewish state and pleaded that the city be placed under international control. Before and during the Second World War, Haredi opposition to the Zionists persisted. But after the war, the devastating consequences of the Holocaust softened the position of many towards Zionism. The ultra-orthodox in Eastern Europe had perished in vast numbers; whole communities had been wiped out. One rabbi, Yisachar Shlomo Teichtal, hiding in Budapest in 1942 and witnessing the persecution of the Jews, renounced his previous hostility to the Zionist movement and instead strongly criticised the Orthodox establishment for not taking the lead in re-establishing the Jewish homeland. After World War II many Jewish refugees found themselves in Displaced person camps. The Zionists controlled a camp for Jewish refugee children near Haifa, Israel where they operated an anti-religious policy in an effort to cut off Haredi children from their spiritual roots. To a large extent they were successful, and many children from Haredi homes were "poisoned against religion". The relationship between Haredim and Zionism became more complex after the founding of the State of Israel in 1948. Some Haredi groups adopted a pragmatic position, and involved themselves in the political process of the state by voting in elections and accepting state funding. Others have maintained a more hardline rejectionist position, refusing all funding from the Israeli state and abstaining from taking part in the political process. The positions of specific Haredi groups are discussed in greater detail in the remainder of the article. There is also a growing group of Orthodox Jews known as Hardalim. They are Religious Zionists who moved in their religious observances towards Haredi Judaism. Philosophically, however, they form a part of the Religious Zionist world, and not of the Haredi world. United Torah Judaism and Shas are the only two Haredi parties in the Israeli Knesset which advocate a halachic state. In addition, even the anti-Zionist Satmar Hasidim do take part in municipal elections in some places, such as the Haredi stronghold of Bnei Brak. Notably, there is a substantial difference in the positions taken by Ashkenazi and Sephardi Haredim, the latter generally being quite supportive of Zionism. There are many different ideological reasons for religious opposition to Zionism; however, the main two are most widely expressed by Hasidim and Lithuanian Haredeim. The overarching motive behind Haredim's opposition to Zionism stems from a historical animosity and rivalry between orthodox observant Jews and secular progressive forces throughout Jewish Exile history. Many Haredim see Zionism as another battle against forces within who are out to redefine and eradicate traditional Judaism. However, there is also an Halachic standpoint which makes the case against Zionism even if Israel would - hypothetically - have been a theocracy, where Israel would have been governed under strict Jewish laws. Historically, many dynasties in Hasidism have expressed anti-Zionist opinions because of the 'Three Oaths'. The Talmud, in Ketubot 111a, mentions that the Jewish people have been bound by three oaths: 1) not to ascend to Eretz Yisrael (the Land of Israel) as a group using force; 2) not to rebel against the nations of the world; and 3) that the nations of the world would not persecute the nation of Israel excessively. Some consider the establishment of the State of Israel to be a violation of these oaths. The first Hasidic anti-Zionist movement was Agudath Israel, established in Poland in 1912. Hareidi groups and people actively and publicly opposing Zionism are Satmar, Toldos Aharon, Neturei Karta. Lithuanian Haredim, sometimes called mitnagdim, take a different approach to their beliefs from their Hassidic counterparts. Lithuanian religious Jews oppose the state not because of the three oaths midrash but because they feel that Zionism epitomizes secularity and Jewish desire to be void of Torah. Many Lithuanian religious Jews, such as Rabbi Yosef Sholom Elyashiv, have been involved with Zionist politics as Israel progressively becomes more Jewish-oriented. Amongst the Ashkenazi Orthodox rabbinical leadership, religious Zionists form a minority. Generally speaking, most Sephardi Haredi authorities have never shared the anti-Zionism of their Ashkenazi counterparts, and some (such as the late Rabbi Mordechai Eliyahu) are strongly affiliated with Religious Zionism, taking a similar stance to the Hardal movements.. However, there are anti-Zionist elements in the Sefardic communities as well. It is known that the late Baba Sali supported and celebrated the anti-Zionist views of the Satmar Rebbe. Flyer in Meah Shearim which declares "No entry to Zionists!" There are a number Haredi groups which not only oppose Zionism, but also do not recognize the State of Israel. Among them are the Hasidic sects of Shomer Emunim (and its offshoots, Toldos Aharon, and Toldos Avrohom Yitzchok), Mishkenos HoRoim, and Dushinsky. In July 1947, Rabbi Yosef Tzvi Dushinsky, Chief Rabbi of the Jerusalem-based Edah HaChareidis, declared to the United Nations his "definite opposition to a Jewish state in any part of Palestine". The largest anti-Zionist Hasidic group is Satmar, which has around 130,000 adherents worldwide. The group’s position was crystallized by their charismatic leader, Rabbi Joel Teitelbaum, who authored comprehensive and polemic tracts detailing his opposition to Zionism. He encouraged his followers who lived in the "Holy Land" to form self-sufficient communities, rejecting social state benefits, and not to vote in general elections. Anxious not to be viewed as supportive of the actions of the secular Israeli government, which he viewed as an abomination, he instructed people not to visit the Western Wall and other holy sites which had been captured by Israel in the 1967 war. One of the most extreme sects is the Neturei Karta. Formed in 1938 as a breakaway from Agudath Israel, its 5,000 members are based mainly in Jerusalem and Beit Shemesh. A faction within the group openly supports the PLO and Hamas, and calls for the "peaceful dismantling of the Zionist entity". The Agudat Israel is an international organization (with an Israeli association) of various Haredi groups, mainly from the Lithuanian yeshiva communities and Hasidic groups such as Ger and Belz. It initially adopted a stance of disregard for the State of Israel, motivated by pragmatism. They attempted to influence the politics of the State of Israel from within, by participating in national elections and sending their representatives to the Israeli Knesset, but still did not take full part in it by not serving in its military, and not celebrating any of the State's official holidays. Today, the organization has shifted over time to somewhat supportive of the state, although not officially recognizing itself as a pro-Zionist party. An example of this is the revolutionary Hesder legions in the IDF, which is a unit that combines religious studies and national service, designed specially for Haredi Jews. 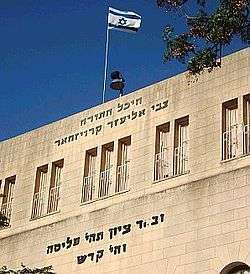 The Agudat Israel party in the Knesset is represented as United Torah Judaism, a collective party of Agudat Israel and Degel HaTorah. It tries to influence the Knesset with a pro-Judaism outlook, by mainly focusing on funding for Jewish education (yeshivas), exemption from military service for Haredi yeshiva students, and trying to strengthen Israel's Jewish identity. Ponevezh yeshiva on Israel Independence Day. The flag is flown as a compromise with the government to allow them to keep accepting national funding. A number of Lithuanian (non-Hasidic) leaders like the Chazon Ish (1878–1953), Rav Shach (1898–2001), and Rabbi Yosef Sholom Elyashiv (1910-2012), have expressed strongly anti-Zionist views. Examples of this are found in lectures and letters of Rav Shach. One of the newspapers of the Litvish world, the Yated Neeman, regularly publishes articles strongly criticizing Zionism, naming it a "heretical movement". The main Litvish community does vote, as per the instructions of the Chazon Ish. Rabbi Elyashiv urges his students to vote for the Degel HaTorah list. Rabbi Shimshon Dovid Pincus, quoted in the book of his speeches about Purim, explains that in each generation, the Yetzer Hara (evil inclination) appears in different forms. Examples he gives are the Enlightenment and communism. He goes on to explain that nowadays, Zionism is a form of the Yetzer Hara. The opposition of the Litvish world against Zionism differs from that of the Hasidic world in that it is mainly focused on the secular character of Zionism, and less strongly so on the issue of a Jewish state being forbidden whether it is religious or not. Anti-Zionism does not translate to personal antagonism, and Rabbi Chaim Shmuelevitz, the Mirrer rosh yeshiva, openly displayed thanks to soldiers of the Israeli army. The Soloveitchik dynasty of Lithuanian Haredi Judaism is known as one of the most elite scholastic dynasties in all of Orthodox Judaism. The dynasty split into two groups in the 20th century, as parts of the Soloveitchik Rabbinical family veered away from their anti-Zionist tradition set by Rabbi Chaim Soloveitchik of Brisk, and adopted views aligned with Modern Orthodox Judaism and Religious Zionism. Ironically, the Zionist faction of the Brisker dynasty was centered in the United States, and the anti-Zionist faction was and continues to be centered in Israel. Rabbi Avraham Yehoshua Soloveitchik and Rabbi Dovid Soloveitchik, who lead two of the Brisker yeshivos in Jerusalem, continue to be outspoken opponents of Zionism. While ideologically opposed to secular Zionism, the moderate Hasidic groups of Ger, Vizhnitz, Belz, and Klausenberg do vote in the Israeli elections, support religious Zionism, and accept Israeli government funding. Ger and Belz are two of the most influential movements behind the Israeli political party Agudat Yisrael, which, together with the Lithuanian Degel HaTorah, forms the United Torah Judaism party. Prominent Gerrer rabbi, Yitzhak-Meir Levin, was a signatory to the Israeli Declaration of Independence. He also served as Minister of Welfare, though today, members of Agudat Israel prefer to serve as Deputy Ministers, or in Knesset Committees. These groups do not observe any days associated with the state, and neither do they recite the Prayer for the State of Israel. Agudat's position evolved into one generally cooperative with the State of Israel, with an emphasis on supporting religious activities within its borders and the maintenance of Haredi institutions. Some rebbes affiliated with Agudat, such as the Sadigura rebbe Avrohom Yaakov Friedman, took more hard-line stances on security, settlements, and disengagement. The fifth Lubavitcher Rebbe, Rabbi Sholom Dovber Schneersohn (1860–1920), also known as the RaShaB, published Kuntres Uma'ayan, the beginning of which contains a strong polemic against secular Zionism. He was deeply concerned that secular nationalism would replace Judaism as the foundation of Jewish identity. The seventh Lubavitcher Rebbe, the late Rabbi Menachem Mendel Schneerson, as wells as his predecessor, Rabbi Yosef Yitzchak Schneerson, nonetheless insisted on trying to increase the observance of the Torah in Israel, both among individuals as well as to make the state's policies more in line with Jewish law and tradition, He also expressed overwhelming support for the State's military endeavors, and vehemently condemned any transfers of land as against Jewish law. His reasoning was based on the code of Jewish law, the Shulchan Aruch  which states that the Sabbath must be violated (carrying weapons) by the residents of a Jewish community (in any country) that borders a hostile gentile settlement, even if they are threatened in the most subtle manner. He viewed the whole of Israel as such a community, and that was the impetus for his support. He argued that the safety of the Jewish people was paramount, and the physical presence of so many Jews in the land meant that its borders had to be protected as a matter of course. At the same time, he also drew support for his statements from the notion in the Torah that the land of Israel was given to the Jewish people, and that inherent Jewish ownership of the land could not be superseded by mere political interests. Nevertheless, he refused to call the state by name, claiming that the holy land exists independent of any authority that sees itself as sovereign over the land. The Lubavitcher Rebbe embraced the land of Israel as place where God can always be found, no matter how secular some of its inhabitants may be. He was a man who is believed by his followers to have loved every Jew, and to have especially loved Israel. Many Chabadniks in the world live in Israel, and there are a great deal of Chabad houses there. Their young men serve in the Israeli military. In line with the late Rebbe's instructions to vote for a party that refuses to support giving away parts of the Land of Yisrael as part of any peace negotiations, Chabad does not endorse any particular party in the election process. Chabad Yeshiva students have been joining the IDF in record numbers. There are Chabad synagogues that celebrate Yom Ha'atzmaut. Chabad Rabbi Shimon Rosenberg spoke at Yom Hazikaron Ceremony in Jerusalem in 2011. He also lit one of the torches at the Zionist state ceremony commemorating Israel Independence Day on behalf of his grandson, Chabad Rabbi Moshe Hotzberg. Chabad Rabbi Sholom Lipskar celebrated Jerusalem Day at Yeshiva Mercaz HaRav in Jerusalem, the most prominent yeshiva in the Religious Zionist world. Chardal Jews usually refers to the portion of the Religious Zionist Jewish community in Israel which inclines significantly toward Charedi ideology (whether in terms of outlook on the secular world, or is their stringent (machmir) approach to Halacha); however, it is sometimes used to refer to the portion of the Charedi Jewish community in Israel which inclines significantly toward Religious Zionist ideology. Chardal is an initialism of the words Charedi and Leumi. Sephardic Haredim are generally supportive of Zionism and the State of Israel, certainly more so than their Ashkenazi counterparts. The number of outspoken opponents of Zionism among Sephardi or Mizrahi rabbis is far lower than among Ashkenazi rabbis, and these constitute a small minority of the Sephardi Haredi leadership. The Sephardi Haredi political party in the Knesset is Shas, which represents the vast majority of Sephardi Haredim, and is headed by Rabbi Eli Yishai. In 2010, Shas joined the World Zionist Organization, and officially became the first Zionist Haredi party. The party's long-time spiritual leader, Rabbi Ovadia Yosef, opposed saying Hallel in the Yom HaAtzmaut prayer service, but writes that, "One may say Hallel after the completion of the prayers, without the blessing..." While in the past, when he served as Chief Rabbi of the State of Israel, he wrote that one should say Hallel (though without the blessings preceding and following it), he later changed his position. Shas is the dominant umbrella organization and political party among Sephardic Haredim, and represents an overwhelming majority of the Sephardi Haredi population. In 2010, Shas joined the World Zionist Organisation, and became the first officially Zionist Haredi political party. According to Shas MK Yaakov Margi, Shas has long operated as a Zionist party: "There's nothing earth-shaking about saying Shas is a Zionist party. We operate as such, we join governments and are partners in the Zionist experience, (our members) serve in the army. There's nothing new here." There are a number of Sephardic organizations and rabbis who actively oppose the state, such as Rabbi Yaakov Hillel and the Edah HaCharedit HaSefaradit. They draw their ideology from the writings of Sefardi leaders such as the Ben Ish Chai, who lived before the State of Israel was founded, and the Baba Sali, who openly praised the book VaYoel Moshe of the Satmar Rebbe. The main Haredi newspapers, Hamodia, HaMachane HaHaredi and Yated Neeman, occasionally publish articles strongly criticizing Zionism, naming it a "heretical movement". They sometimes refer to the country as "Israel", and at other times will only refer to the geographical entity as "Eretz Yisroel". The Israel news columns are almost exclusively right of centre, lambasting Arab terrorism. Articles about outreach movements in Israel and Israeli culture are very common, and are shown without ideological bias. Several books on the issue of Zionism were written by different rabbis. Vayoel Moshe was written by the Satmar Rebbe, Rabbi Joel Teitelbaum (1887–1979). It consists of three parts: Maamar Shalosh Shevuos (three oaths), Maamar Yishuv Eretz Yisroel (settling the Land of Israel), and Maamar Loshon HaKodesh (the holy language). The first part, discusses the three oaths mentioned in Ketubot 111a - that the Jewish people are not allowed to ascend to Eretz Yisrael by force, that the Jewish people are not allowed to rebel against the nations of the world, and that the Jewish people may not by their sins delay the coming of Moshiach, the Jewish messiah. It is primarily a book of Halacha (Jewish law). Rabbi Teitelbaum refers to Religious Zionism as a major desecration of G-d's name, blames Zionism for the Holocaust, and refers to Zionist leaders such as Theodor Herzl as "heretics". Also written by the Satmar Rebbe, Rabbi Joel Teitelbaum, this small book consists of inspirational polemics against Zionism. He wrote it in 1967 as a rebuttal to those who said that the Six Day War was a divine miracle that showed God's support for the State of Israel, saying instead it was a test from God to see whether we would follow the Torah or be led astray by miracles which seemed to support Zionism in the eyes of the masses. He compared this to the miracles that are often done by idolaters in support of their religions, inasmuch as Judaism is not based on miracles, but rather the national revelation on Sinai. Eim HaBanim Semeicha was written by Rabbi Yisachar Shlomo Teichtal, and published in 1943. Teichtal grew up as a staunch anti-Zionist Chasid of the Munkatsher Rebbe. However, during the Holocaust, Rabbi Teichtal changed his position from the one he espoused in his youth. The physical product of that introspection is the book, Eim HaBanim Semeicha, in which he specifically retracts his previous viewpoints, and argues that the true redemption can only come if the Jewish people unite and rebuild the land of Israel. Many of his coreligionists viewed the book with skepticism, some going so far as to ban Rabbi Teichtal from their synagogues. In the book, Rabbi Teichtal strongly criticizes the Haredim for not supporting the Zionist movement. When it was written, it was a scathing criticism of the Jewish Orthodox establishment, and Agudat Israel in particular. Tel Aviv, symbol of Zionism, crossed out on this traffic sign in Jerusalem. Among Haredi anti-Zionist movements, opinions differ on what attitude to take now that de facto a state exists. Some movements remained actively anti-Zionist, while others lowered their voice; some refuse to vote, while others do vote; some accept money from the government, while others will not. Many Hasidic Rebbes with followers in the land of Israel, including the Gerrer Rebbe, the Belzer Rebbe, the late Lubavitcher Rebbe, and others have encouraged their followers to vote in Israeli elections. Lubavitcher Hasidim are encouraged to join the Israeli Defense Forces, in order to ensure the state's security (inasmuch as the State's security is inextricably entwined with the safety of the Jewish people who live within its borders). Meanwhile, the Edah HaChareidis Rabbinical Council of Jerusalem and its associated communities, including Satmar, Dushinsky, Toldos Aharon and Toldos Avrohom Yitzchok, do not vote and do not accept government money. Around election days, posters by the Edah HaChareidis are posted throughout Haredi neighborhoods of Jerusalem proclaiming that it is forbidden to vote in the elections, and that doing so is a grave sin. The Edah HaChareidis and its affiliated movements have permitted cooperating with the Israeli police under extenuating circumstances. ↑ ha-Peles; volume 3, issue 4. ↑ Archived January 24, 2013, at the Wayback Machine. ↑ Ben-Rafael, Eliezer (2008). "The Faces of Religiosity in Israel: Cleavages or Continuum?". Israel Studies. 13 (3): 89–113. JSTOR 30245833. ↑ "In brief: Hate for Chareidim". Jewish Tribune, London. 2006-11-02. p. 9. 1 2 Yôsēf Śalmôn (2002). Religion and Zionism - first encounters. Hebrew University Magnes Press. p. 349. ISBN 978-965-493-101-4. Retrieved 30 May 2013. There is no doubt that R. Hayyim expressed an extreme anti-Zionist position; when the Zionists in Brisk argued that Zionism constituted a barrier against the assimilation of western Jews, he replied that, for Judaism, the quality and not the quantity was essential. In limiting the concept klal yisrael (the entire Jewish people) to the "God-fearing" alone, he was moving closer to the philosophers of German Orthodoxy. ↑ Gideon Shimoni; Robert S. Wistrich (1999). Theodor Herzl: visionary of the Jewish State. Herzl Press. p. 303. ISBN 978-0-930832-08-7. Retrieved 8 May 2013. ↑ Tzvi Rabinowicz (1996). The Encyclopedia of Hasidism. Jason Aronson. p. 201. ISBN 978-1-56821-123-7. Retrieved 8 May 2013. ↑ Diaspora Nationalism and Jewish Identity in Habsburg Galicia. Cambridge University Press. 31 August 2012. pp. 170–171. ISBN 978-1-107-01424-4. Retrieved 9 May 2013. ↑ Diaspora Nationalism and Jewish Identity in Habsburg Galicia. Cambridge University Press. 31 August 2012. pp. 172–173. ISBN 978-1-107-01424-4. Retrieved 9 May 2013. ↑ Adam Z. Newton (2001). The fence and the neighbor: Emmanuel Levinas, Yeshayahu Leibowitz, and Israel among the nations. SUNY Press. p. 233. ISBN 978-0-7914-9144-7. Retrieved 30 May 2013. ↑ Shalom Goldman (2009). Zeal for Zion: Christians, Jews, and the Idea of the Promised Land. UNC Press Books. pp. 272–73. ISBN 978-0-8078-3344-5. Retrieved 9 May 2013. The most eminent Orthodox rabbis of the first decade of the twentieth century, among them the Lubavitcher rebbe Sholom Dov Ber Schneersohn, issued powerful condemnations of political Zionism. Schneersohn, in 1903, warned that the Zionists "have made nationalism a substitute for the Torah and the commandments… After this assumption is accepted, anyone who enters the movement regards himself as no longer obliged to keep the commandments of the Torah, nor is there any hope consequently that at some time or another he will return, because, according to his own reckoning, he is a proper Jew in that he is a loyal nationalist. ↑ Gershon David Hundert; Yivo Institute for Jewish Research (28 May 2008). The YIVO encyclopedia of Jews in Eastern Europe. Yale University Press. p. 1662. ISBN 978-0-300-11903-9. Retrieved 9 May 2013. ↑ Yosef Eisen (2004). Miraculous Journey: A Complete History of the Jewish People from Creation to the Present. Targum Press. p. 345. ISBN 978-1-56871-323-6. Retrieved 8 May 2013. ↑ Jonathan Sacks (1992). Crisis and Covenant: Jewish Thought After the Holocaust. Manchester University Press. p. 66. ISBN 978-0-7190-4203-4. The saintly Rabbi Israel Meir ha-Cohen invoked the talmudic passage of the three oaths to remind his followers that the Jewish fate was to remain in exile until redeemed by God. ↑ Noah J. Efron (2003). Real Jews: Secular Versus Ultra-Orthodox and the Struggle for Jewish Identity in Israel. BasicBooks. p. 36. ISBN 978-0-465-01854-3. Retrieved 9 May 2013. ↑ Heiko Haumann (2002). A History of East European Jews. Central European University Press. p. 178. ISBN 978-963-9241-26-8. Retrieved 9 May 2013. In the inter-war period, the rabbi of Munkács (Mukačevo), Chaim Elazar Spira (Shapira, 1872-1937) — at that time the most resolute opponent of Zionism among Hasidic rabbis — described the three gates of Hell: "The lack of faith of many elements of European Jewry, the absolute subjugation to money in America, and Zionism which was gaining ground in Jerusalem! ↑ "A Jewish Community in the Carpathian Mountains- The Story of Munkács". Yadvashem.org. Retrieved 2015-11-21. ↑ Aaron Phillip Willis (1993). Sephardic Torah Guardians: ritual and the politics of piety. Princeton University. p. 246. Retrieved 17 May 2013. Around this time, the Agudah translated into Hebrew and printed (and then reprinted several times, for interest was high), a pamphlet by Elchanan Wasserman, the headmaster of the Talmudic academy in Baranowicze, killed by the Nazis in 1941. It was Wasserman's view that, theologically, the Zionists were to blame for the Nazis, for they embraced "two idolatries," socialism and nationalism. The rest was inevitable, Wasserman wrote: "In Heaven the two idolatries were fashioned into one — national-socialism. A terrible rod of fury was forged from them that strikes at Jews in every corner of the earth. The same abominations that we worshipped are now hammering us." 1 2 3 Barukh Ḳimerling (1989). The Israeli state and society: boundaries and frontiers. SUNY Press. pp. 176–178. ISBN 978-1-4384-0901-6. Retrieved 17 May 2013. ↑ Yakov M. Rabkin (2006). A Threat from Within: A Century of Jewish Opposition to Zionism. Fernwood Pub. p. 39. ISBN 978-1-55266-171-0. Retrieved 17 May 2013. Rabbi Elhanan Wasserman (1875-1941), a disciple of Hafetz Haim and a pillar of Lithuanian Judaism, compared Zionists to the members of the Yevsektzia, the Jewish section of the Soviet Communist Party. Wielding their own version of secularized messianism, the Jewish Communists attacked traditional Jewish life with extraordinary vehemence. 1 2 Marshall J. Berger; Ora Ahimeir (2002). Jerusalem: a city and its future. Syracuse University Press. p. 236. ISBN 978-0-8156-2913-9. Retrieved 13 May 2013. 1 2 Walter Laqueur (20 May 2003). A History of Zionism: From the French Revolution to the Establishment of the State of Israel. Knopf Doubleday Publishing Group. p. 410. ISBN 978-0-8052-1149-8. Retrieved 13 May 2013. Rosenheim, the political head of central European Orthodoxy, who was accustomed to using far more moderate language, nevertheless warned the religious Zionists against the 'mortal danger' they risked by collaborating with those who did not accept the divine law. ↑ Martin Gilbert (1996). Jerusalem in the twentieth century. John Wiley & Sons, Incorporated. p. 108. ISBN 978-0-471-16308-4. Retrieved 13 May 2013. ↑ Marshall J. Berger; Ora Ahimeir (2002). Jerusalem: a city and its future. Syracuse University Press. p. 238. ISBN 978-0-8156-2913-9. Retrieved 13 May 2013. ↑ Marshall J. Berger; Ora Ahimeir (2002). Jerusalem: a city and its future. Syracuse University Press. p. 240. ISBN 978-0-8156-2913-9. Retrieved 13 May 2013. In another letter to one of the harsh anti-Zionists, Blau gave an excellent description of how he conceived this tragic situation: "Your Honor is mistaken in thinking that peace with the Arabs is possible. The Arabs hate us bitterly. We do not want to cut off the shackles of the Diaspora, but neither do we want to be killed and slaughtered, to be like dung in the field." ↑ Rolin G. Mainuddin (2002). Religion and politics in the developing world: explosive interactions. Ashgate. p. 70. ISBN 978-0-7546-1507-1. Retrieved 9 May 2013. ↑ Roger W. Stump (2000). Boundaries of faith: geographical perspectives on religious fundamentalism. Rowman & Littlefield Publishers. p. 47. ISBN 978-0-8476-9319-1. Retrieved 9 May 2013. ↑ "Rabbi Yosef Tzvi Dushinsky, Chief Rabbi of Jerusalem (1867-1948)". True Torah Jews. Retrieved 2015-11-21. ↑ Colin Shindler (25 March 2013). A History of Modern Israel. Cambridge University Press. p. 73. ISBN 978-1-107-02862-3. Retrieved 24 May 2013. Before 1939, there had been great bitterness in the ultra-orthodox community against the Zionists. Families were divided and dissidents expelled. Even during the war such feelings persisted. For a year, Lithuania was sandwiched in between the two revolutionary goliaths of Nazi Germany and Soviet Russia, yet the majority of the heads of the great learning academies, the yeshivot, advocated staying put rather than attempting to leave for Palestine. Instead they and their followers marched into the gas chambers singing nigunim. The Shoah destroyed the community of the faithful in Eastern Europe and the ultra-orthodox perished in vast numbers. Such a tragedy softened the position of the survivors towards Zionism. It moved many from and anti-Zionist position to a non-Zionist one. ↑ Lichtenstein, Ruth (December 31, 2013). "The History of the 'Status Quo' Agreement". Hamodia (English edition). Retrieved August 31, 2015. One of the main struggles between the Jewish groups was over education, the future of Jewry. In 1943, a group of about 700 orphaned children, Holocaust refugees who had escaped from Poland to the Soviet Union, were collected by the Jewish Agency’s emissaries and brought to Israel. They were put in a camp organized by the Tehran Jewish Agency, where they were poisoned against religion. ↑ "The Jewish Agency". Jafi.org.il. 2014-03-02. Retrieved 2015-11-21. ↑ "EPYC | Places | Shtetl". Epyc.yivo.org. Retrieved 2015-11-21. ↑ Sefer Shomer Emunim by R' Aharon Roth, Sefer Asifas Michtovim, by R' Avrohom Yitzchok Kohn foundational books of the Toldos Avrohom movement, passim. ↑ Archived February 19, 2007, at the Wayback Machine. ↑ Lorincz, Shlomo (August 9, 2006). "Chapter Twenty-Seven: I Gave My Blood and Soul". Memories of HaRav Shach, zt"l. Dei'ah veDibur. Archived from the original on 2007-09-30. Retrieved 2007-09-10. ↑ "What Does The Steipler Say? -- Some Highlights of the Years of His Communal Leadership". We Knew The Steipler Gaon, zt'l -- 23rd Av 5760, His Fifteenth Yahrtzeit. Dei'ah veDibur. September 6, 2000. Retrieved 2007-09-10. ↑ "Hasidic Leader Yaakov Friedman, the Admor of Sadigura, Dies at 84 - Israel News - Haaretz Israeli News Source". Haaretz.com. 2013-01-01. Retrieved 2015-11-21. ↑ "Public Bookmarks". Otzar770.com. Retrieved 2015-11-21. ↑ "Chabad Yeshiva Students Joining the IDF in Record Number | World Mizrachi". Mizrachi.org. 2013-07-18. Retrieved 2015-11-21. ↑ "Yom Haatzmaut BBQ". Chabadcv.com. Retrieved 2015-11-21. ↑ "Yom Ha'atzmaut With Chabad of Ofakim". Shmais.com. 2014-05-08. Retrieved 2015-11-21. ↑ "Rabbi Shimon Rosenberg to Speak - Shturem.org Taking The World By Storm". Shturem.org. Retrieved 2015-11-21. ↑ "Print an Article". VosIzNeias.com. 2011-05-10. Retrieved 2015-11-21. ↑ "Lipskar Attends Jerusalem Day". Collive.com. Retrieved 2015-11-21. ↑ "Chabad is Zionist, Rabbi Says". Israelm=nationalnews.com. Retrieved 2015-11-21. ↑ "Radio Clash: Chabad Vs. Reform". Shmais.com. 2011-05-14. Retrieved 2015-11-21. 1 2 "Shas Becomes First ultra-Orthodox Party to Join WZO - Israel News - Haaretz Israeli News Source". Haaretz.com. 2010-01-19. Retrieved 2015-11-21. ↑ Archived June 22, 2010, at the Wayback Machine. ↑ "EIM HABANIM SEMEICHAH: On Eretz Yisrael, Redemption and Unity". Urim Publications. Retrieved 2015-11-21. ↑ Ed Hamway. "Eim Habanim Semeichah: Em Habanim Semeha:" (PDF). Webcache.googleusercontent.com. Retrieved 2015-11-21. ↑ "Deal Over Final Makeup of UTJ List to Go Down to the Wire - Israel News - Haaretz Israeli News Source". Haaretz.com. Retrieved 2015-11-21. ↑ "Aguddat Israel Political Party". Jewish Virtual Library. Retrieved 2015-11-21. ↑ "Dei'ah veDibur - Information & Insight - NEWS". Chareidi.org. 2004-01-07. Retrieved 2015-11-21. Aviezer Ravitzky, "Munkacs and Jerusalem: Ultra-Orthodox Opposition to Zionism and Agudaism," Zionism and Religion, eds. Shmuel Almog, Jehuda Reinharz, and Anita Shapira (Hanover and London, 1998), 67-89. Yosef Salmon, "Zionism and Anti-Zionism in Traditional Judaism in Eastern Europe," Zionism and Religion, eds. Shmuel Almog, Jehuda Reinharz, and Anita Shapira (Hanover and London, 1998), 25-43.